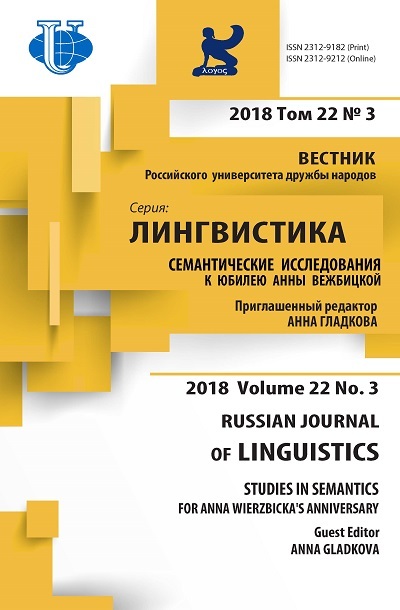 The paper aims to demonstrate that the main contribution of Anna Wierzbicka to linguistics is the idea of semantic decomposition - that is, representing meaning in terms of structurally organized configurations of simpler meanings - and a huge amount of specific decompositions of lexical meanings from many languages. 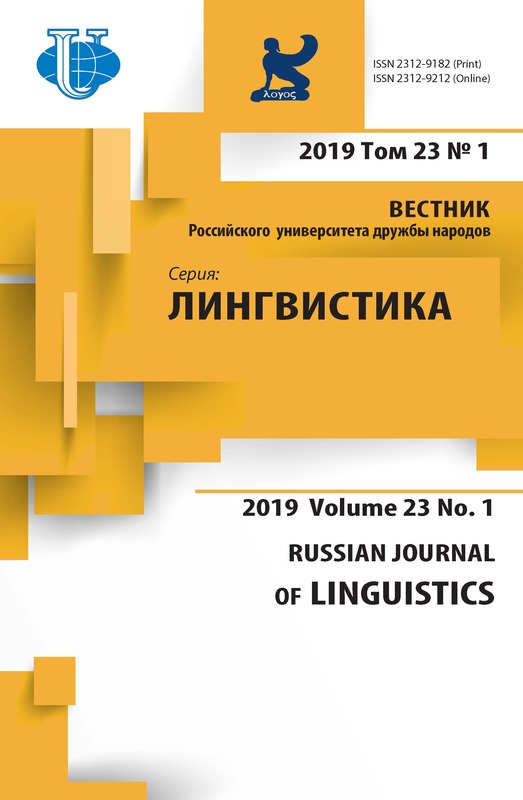 One of possible developments of this idea of Wierzbicka’s is the Meaning-Text linguistic approach, and in particular - the Meaning-Text model of natural language. To illustrate the importance and fruitfulness of semantic decomposition, two Meaning-Text mini-models are presented for English and Russian. Two semantically equivalent sentences of these languages are considered: (1) a. Eng. A honeymooner was fatally attacked by a shark. ~ b. Rus. Molodožën pogib v rezul´tate napadenija akuly vo vremja medovogo mesjaca lit. ‘Young.husband died as result of.attack of.shark during honey month’ The formal representations of these sentences at four levels-Meaning-Text style-are shown: semantic, deep-syntactic, surface-syntactic, and deep-morphological. Examples of formal rules relating the representations of two adjacent levels are presented. semantic decomposition, formal linguistic modeling, Meaning-Text approach, semantic representation, deep-/surface-syntactic and deep-morphological representations, linguistic rules. Case postale 6128 Centre-ville, Montréal H3C3J7, Canada	Professor Emeritus at the University of Montreal, Canada, the author of 47 books and 279 published scientific papers. His research interests include general linguistics (with special attention to its conceptual apparatus and terminology), semantics (with special attention to lexicology and lexicography), syntax (with special attention to dependency structures), and morphology; his work is based mostly on Russian and French, but concerns also English and several other languages (Hungarian, Lezghian, Alutor, Dyirbal, Bafia, Kirundi, Korean). He is the proponent of the MeaningText approach to natural language and one of the pioneers of Machine Translation-since 1954. Apresjan, Jurij. (1974). Leksičeskaja semantika. Sinonimičeskie sredstva jazyka [Lexical Semantics. Synonymic Means of Language]. Moscow: Nauka. Apresjan, Yuri. (1992). Lexical Semantics. User’s Guide to Contemporary Russian Vocabulary. Ann Arbor, MI: KAROMA. Apresjan, Jurij, ed. (2014). Aktivnyj slovar´ russkogo jazyka [Active Dictionary of Russian]. Avtory: V.Ju. Apresjan, Ju.D. Apresjan, E.È. Babaeva, O.Ju. Boguslavskaja, I.V. Galaktionova, M.Ja. Glovinskaja, B.L. Iomdin, T.V. Krylova, I.B. Levontina, A.A. Lopuxina, A.V. Ptencova, A.V. Sannikov, E.V. Uryson. Volumes 1-2. Moscow: Jazyki slavjanskoj kul´tury. Apresyan, Yuri, Mel’čuk, Igor & Žolkovsky, Alexander. (1969). Semantics and lexicography: Towards a new type of unilingual dictionary. In: F. Kiefer, ed., Studies in Syntax and Semantics, Dordrecht: Reidel, 1-33. Goddard, Cliff & Wierzbicka, Anna. (2014). Words and Meanings. Lexical Semantics across Domains, Languages, and Cultures. Oxford: Oxford University Press. Mel´čuk, Igor. (1974). Opyt teorii lingvističeskix modelej “Smysl Û Tekst”. Semantika, sintaksis [Outline of a Theory of Meaning-Text Linguistic Models. Semantics and Syntax]. Моscow: Nauka. Mel’čuk, Igor. (2001). Communicative Organization in Natural Language. Amsterdam/Philadelphia: John Benjamins. Mel’čuk, Igor. (2012a). Jazyk: ot smysla k tekstu [Language: From Meaning to Text]. Moskow: Jazyki slavjanskoj kul´tury. Mel’čuk, Igor. (2012b. Semantics: From Meaning to Text. Vol. 1. Amsterdam/Philadelphia: John Benjamins. Mel’čuk, Igor. (2013). Semantics: From Meaning to Text. Vol. 2. Amsterdam/Philadelphia: John Benjamins. Mel’čuk, Igor. (2015). Semantics: From Meaning to Text. Vol. 3. Amsterdam/Philadelphia: John Benjamins. Mel’čuk, Igor. (2016). Language: From Meaning to Text. Moskow/Boston: Academic Studies Press. Mel’čuk, Igor & Zholkovsky, Alexander. (1984). Explanatory Combinatorial Dictionary of Modern Russian. Vienna: Wiener Slawistischer Almanach. See also: http://olst.ling.umontreal.ca/pdf/Melcuk_Zholkovsky_1984.pdf. Mel’čuk, Igor´ & Žolkovskij, Aleksandr. (2016). Tolkovo-kombnatornyj slovar´ russkogo jazyka. 2-oe izdanie, ispravlennoe. Moscow: Jazyki slavjanskix kul´tur. Padučeva, Elena. (1996). Fenomen Anny Vežbickoj [Anna Wierzbicka’s Phenomenon]. In: Vežbickaja, Anna, Jazyk. Kul´tura. Poznanie, Moscow: Russkie slovari, 5-32. Wierzbicka, Anna. (1972). Semantic Primitives. Frankfurt am Main: Athenäum. Wierzbicka, Anna. (1988). The Semantics of Grammar. Amsterdam/Philadelphia: John Benjamins. Wierzbicka, Anna. (1992). Semantics, Culture, and Cognition. Universal Human Concepts in Culture-Specific Configurations. New York/Oxford: Oxford University Press. Wierzbicka, Anna. (2001). What Did Jesus Mean? Explaining the Sermon on the Mount and the Parables in Simple and Universal Human Concepts. Oxford: Oxford University Press. Wierzbicka, Anna. (2014a). Imprisoned in English. The Hazards of English as a Default Language. Oxford: Oxford University Press. Wierzbicka, Anna. (2014b). Can there be common knowledge without a common language? German Pflicht versus English Duty. Common Knowledge, 21 (1), 140-171. Wierzbicka, Anna. (2018). Speaking about God in universal words, thinking about God outside English. In: Paul Chilton and Monika Kopytowska (eds. ), Religion, Language, and the Human Mind, 19-51. Oxford: Oxford University Press. Žolkovskij, Аleksandr. (1964a). Predislovie [Foreword]. Mašinnyj perevod i prikladnaja lingvistika, 8, 3-16. Žolkovskij, Аleksandr. (1964b). O pravilax semantičeskogo analiza [Rules for semantic analysis]. Mašinnyj perevod i prikladnaja lingvistika, 8, 17-32. Žolkovskij, Аleksandr. (1964c.) Leksika celesoobraznoj dejatel´nosti [Vocabulary of teleological activity]. Mašinnyj perevod i prikladnaja lingvistika, 8, 67-103. Žolkovskij, Аleksandr, Leont´eva, Nina & Martem´janov, Jurij. (1961). O principial´nom ispol´zovanii smysla pri mašinnom perevode [On an essential use of meaning in machine translation]. In: Mašinnyj perevod, vol. 2, Moscow: Institut točnoj mexaniki i vyčislitel´noj texniki AN SSSR, 17-46. NB: For English translations of Zholkovsky’s papers, see Rozencvejg, V. (ed.) (1974), Essays on Lexical Semantics, Stockholm: Skriptor; and Rozencvejg, V. (ed.) (1974), Machine Translation and Applied Linguistics, Frankfurt am Main: Athenaion Verlag. Žolkovskij, Аleksandr & Mel´čuk, Igor´. (1965). O vozmožnom metode i instrumentax semantičeskogo sinteza [On a possible method and some tools of semantic synthesis]. Naučno-texničeskaja informacija, 5, 23-28. Žolkovskij, Аleksandr & Mel´čuk, Igor´. (1966). O sisteme semantičeskogo sinteza. I. Stroenie slovarja [A system for semantic synthesis. I. The structure of the dictionary]. Naučno-texničeskaja informacija, 11, 48-55. Žolkovskij, Аleksandr & Mel´čuk, Igor´. (1967). O semantičeskom sinteze [On semantic synthesis]. Problemy kibernetiki, 19, 177-238. Copyright (c) 2018 Mel’čuk I.A.